I have a question. I don't know the answer and I'm not sure anyone does. But certainly this post will be read by some people with a lot more knowledge of the subject than I have. 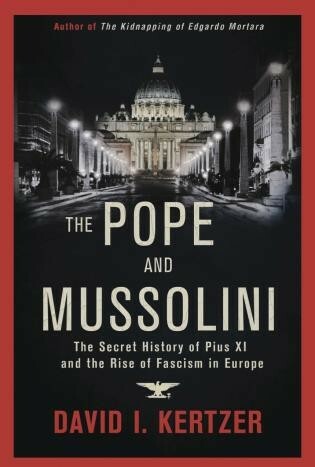 The other day, in the New Republic, I read a long review by Saul Friedlander of The Pope and Mussolini: The Secret History of Pius XI and the Rise of Fascism in Europe, by David Kertzer. The pope and Il Duce both came to power in Rome in 1922 and, to a degree, were like-minded. Friedlander quotes Kertzer writing, "Neither had any sympathy for parliamentary democracy. Neither believed in freedom of speech or freedom of association. Both saw communism as a grave threat . . ."
Eventually they fell out over Hitler's extreme racial and anti-Semitic ideology, which Mussolini went along with. The book describes Pius XI's decision to issue an encyclical denouncing the policy, a document that his senior counselors (one of whom would succeed him as pope) bitterly opposed and quashed unpromulgated when the pope died in 1938. This startled me. Most of us, I believe, think of sexual misconduct by some priests as a secret the Catholic church kept far too long and well. But no, on second thought, how could that be? If you'll forgive the flagrant oversimplification, every priest has a brother who's a cop; every cop has an uncle who's a priest. How could the secret be kept at all? Why would a J. Edgar Hoover, who in his day assiduously strove to know everyone's secrets, have no idea of the church's? My question is this: where else—if anywhere—did church leaders go along with local powers that be because they feared disclosure? Are there dioceses in the U.S. or abroad that were a little too eager to please local authorities by providing them with votes, volunteers, and a blessing for every initiative—but in return were tacitly assured their secrets would be kept? Where—if anywhere—did pederasty go uninvestigated because the church was being blackmailed? I wonder. Can anyone tell me more?